Musicforte.com offers songbooks, sheet music and music reference materials to artists and music fans. It relies heavily on search engine optimization for sheet music sales and hosts a social network of over 40,000 musicians. Unfortunately, the site is suffering from poor conversion rates. Given the direct traffic, Music Forte’s Greg Percifield is somewhat perplexed at why the site’s sales are so low and hopes that a site grading will help shed light on the reasons. Achieving acceptable conversion rates involves two key steps. First, you need to attract the quality visitors. Second, you need to convert these prospects into buyers. Let’s see how Music Forte stacks up. Qualified prospects must first find your website, and once at your site it must be easy for them to locate the products they are seeking. Musicforte.com has a lot of great content to capture specific long-tail (i.e. little known) products. 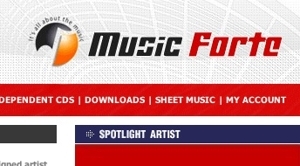 However, for a range of searches both general and more specific, Musicforte.com failed to have pages ranking high on search engine result pages. There was little evidence for specific long-tail paid search campaigns, so there is a marketing opportunity being missed here. The on-site search box is located in a prominent position, and the search results allow some good basic sorting methods such as by popularity, price and alphabetically. However, we found the search results take a long time to load, and by default only the product title is searched, meaning that searches for sheet music for specific songs are often not returned. Remember, website visitors usually take just two to three seconds to decide whether to stay or leave. The basic grid layout of pages for Musicforte.com is good. Images to demonstrate product covers are generally good, but other images (such as buttons and icons) look low quality. Overall there were no consistent styles applied throughout the site, and visually the pages appeared to be rather cluttered. This leads to a somewhat unprofessional look. The use of red is used inappropriately to draw attention to content (such as prices). Unless red is a specific brand-related color, it should really be reserved for use in error messages and warnings. The sheet music home page itself looks more like a category gateway page. There is a lot of focus on specific content rather than assisting visitors find pathways to locate products they are looking for. It doesn’t matter how good your site looks, if it’s difficult to use, you’ll have trouble converting prospects into buyers. Musicforte.com gets some of the basics right. Customers are free to add items to the shopping cart without having to sign in or register, forms are easy to complete and can be tabbed through and there are no loud flashing adverts or annoying pop ups. However, there are also some quite serious usability problems on the site. For example, while the shopping cart is displayed on every page, for us it often showed zero items even when there were multiple items in the cart. No matter how many items we added to the cart we were always told that we had to spend extra money to qualify for free shipping, and once in the checkout process we found it to be confusing at points. To convert well, a site needs to encourage consumers to move towards conversion goals and also needs to respond well to their questions. Musicforte.com focuses mainly on its products and offers little to the needs for which they are used. 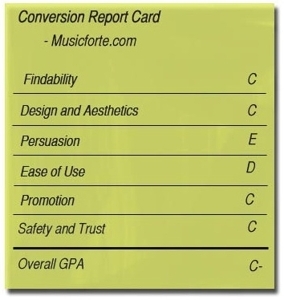 Performing or learning music is an emotional experience, and while Musicforte.com recognizes different needs by identifying various categories (such as church, solo and band music), it doesn’t support the common scenarios of customers from these categories, such as good music for young learners. The most compelling persuasion factor is a low flat-rate price for U.S. shipping or free shipping for orders over $35. However, the call to action to first add items to a shopping cart is generally weak (on product pages this is a gray button that almost looks disabled). On category pages and search result pages there is no ability to add an item to the cart. Once items have been added to the cart there is no compelling message to check out. Instead weaker language to “view cart” is used. Overall, the website provides no compelling reasons to suggest customers to continue with an immediate purchase, which suggests there is a missed opportunity here to increase conversion. On-site promotion can be an effective method to increase sales and order values. However, done poorly it can be a real turn-off. Within specific product pages there are clearly distinguishable recommendations for other products, however the relevance of these seem to be a bit hit or miss. The home page promotes some specials such as products that are under $10 and also products that qualify for free shipping (by costing $35 or more) but these sit clearly “under the fold” and so are probably not easily seen. There are no apparent benefits (such as a discount) for purchasing additional items other than to spend more than $35 to quality for free shipping. However the free shipping is the lower value shipping option and can be purchased at anytime for $2.99, so it is probably not being perceived by customers as a strong incentive to purchase more. Overall Musicforte.com provides some great resources, such as believable testimonials, a credible “about us” page and an anti-spam policy, to ensure customers they are dealing with a credible and trustworthy company. Unfortunately, from the sheet music section of the website they are not easy to find. At the top of every page there is a link for “do you have questions?” which opens a live chat window. Unfortunately, from this window no alternatives were supplied, such as access to FAQs or contact details either by phone or email, and there seemed to be something wrong with the live chat interface. Whenever we submitted a question, the window simply closed. Within the checkout process personal details are not transmitted securely over https. Instead a secure web session only started when asked for credit card details. This is not good practice. Music Forte is clearly a highly credible company and provides great resources for its online community. However, the marketing and conversion issues are leading to unsatisfactory conversion performance. Addressing these issues would make Music Forte’s store far more successful.